These Lemon Cheesecakes have three layers. Each individual cheesecake starts with a Graham Cracker Crust. Next, is a creamy smooth and dense cheesecake filling. The topping is a deliciously tangy sweet lemon curd. I especially like how the tanginess of the lemon curd offsets the richness of the cheesecake filling. The most important thing to remember when making the cheesecake filling is to have all the ingredients at room temperature. Beat the cream cheese until it is creamy and smooth (no lumps) and then add the sugar. Make sure you scrape down the bowl often to remove any lumps and beat the cheesecake batter at medium low speed. This will reduce the amount of air incorporated into the batter which will result in a wonderfully dense cheesecake. These cheesecakes are baked in muffin cups and for easy removal, line the muffin cups with paper liners. The cheesecakes are baked in a slow oven to prevent cracking and are fully baked when the filling is set but still a little wet and wobbly in the center. Let cool to room temperature before covering and placing in the refrigerator until firm (several hours or preferably overnight). Then cover with the Lemon Curd. Lemon Curd is a thick, soft and velvety cream that has a wonderful tart yet sweet citrus flavor. You can buy Lemon Curd or you can make your own. Lemon Curd is similar to a lemon filling or custard in that it is cooked on the stove yet it does not contain a thickener such as cornstarch. We cook the curd in a heatproof bowl placed over a saucepan of simmering water (a double boiler). This method does take a little longer, but it helps prevent the eggs from curdling. Once the lemon curd has become nice and thick (176 degrees F - 74 degrees C), remove from the heat and strain to remove any lumps that may have formed. Then stir in the butter and lemon zest. Cover immediately with plastic wrap to prevent a skin from forming. You will find that the lemon curd will continue to thicken as it cools. Lemon Curd can be refrigerated for up to a week and it can be frozen. Lemon Curd: In a heatproof bowl, preferably stainless steel, placed over a saucepan of simmering water, whisk together the eggs, sugar, and lemon juice until blended. Heat, stirring constantly, until the mixture becomes thick (like sour cream) (166 degrees F or 74 degrees C) and coats the back of a spoon. (This will take approximately 10 minutes.) Remove from heat and immediately pour through a fine strainer to remove any lumps. Whisk in the butter until the butter has melted. Add the lemon zest and cover immediately to prevent a skin from forming. Let cool to room temperature and then refrigerate until firm. This will take several hours (preferably overnight). Cheesecakes: Preheat your oven to 300 degrees F (150 degrees C) and place the oven rack in the center of the oven. Line 12 muffin cups with paper liners. Graham Cracker Crust: In a small bowl combine the Graham Cracker Crumbs, sugar, and melted butter. Press a heaping tablespoon of crumbs onto the bottom of each muffin cup. Cover and refrigerate while you make the filling. Cheesecake Filling: In the bowl of your electric stand mixer, fitted with the paddle attachment (or with a hand mixer), beat the cream cheese on low speed until creamy and smooth. Add the sugar and salt and beat, on medium low speed, until combined. Scrape down the sides and bottom of the bowl as needed. Add the eggs, one at a time, beating until incorporated. Add the vanilla extract and sour cream and beat until smooth. Remove the crusts from the refrigerator and evenly divide the filling among the 12 muffin cups. Bake for about 18 - 20 minutes or until firm but the centers of the cheesecakes are still a little wet and wobbly. Remove from oven and place on a wire rack. Let cool and then cover with plastic wrap and refrigerate for several hours or preferably overnight. To Serve: Once the cheesecakes have been chilled, gently remove the paper liners. Pour a heaping tablespoon of the Lemon Curd on top of each cheesecake. 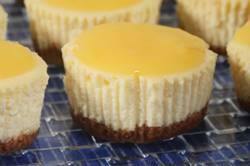 The cheesecakes can be stored for several days in the refrigerator or they can be frozen.